The picture on this page shows the Sewing Classroom, under the instruction of Me. Reginald and Madamn Beck. Can you see the Cross? All 22 positions in sewing are filled, and all of you have supplied the primary operational supplies. 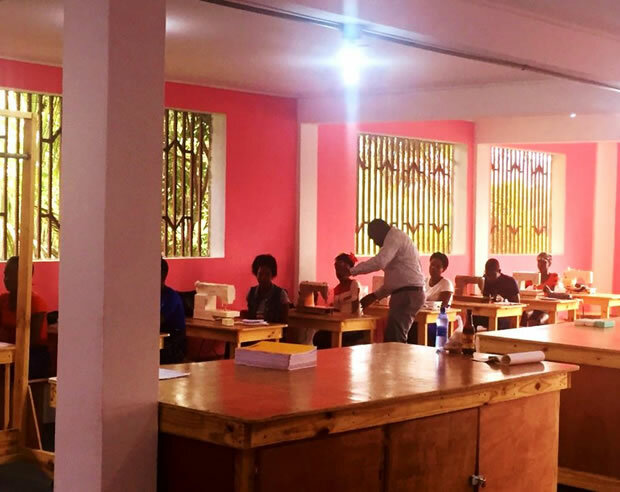 We opened the Sewing, Carpentry, and Computer classes on Jan. 7th. More disciplines will be introduced soon. Our student uniforms are ready for pick-up and the sewing class will be learning with our new 2 station screen printer to print the logo and school name. We want to thank Paul & Sandy Conley and Westminster Presbyterian for the gift of their time and treasure to route computer stations and network equipment to the ‘Lekol Teknik”. The new Classroom Building should be ready for it’s first class before the end of the month. This includes four classrooms and the Tech School office, what a blessing this space will be to open other disciplines. We intend to move forward with completion of the Lab Building foundation in the same timeframe. What are our greatest areas of need right now? Our greatest needs are Computer stations and network, carpentry equipment, the building fund, and instructor salaries. For more updates see our Facebook page below. We praise and thank every one of you for your generosity and sacrifice to make this possible. Without your donations, truly none of this would have been or will be possible. Thank you, Mesi anpil! We look forward to, and enjoy all of your emails, comments, and suggestions… please keep them coming. We are all in this together, Is God speaking to you? Pastor and Ermithe Pierre’s faithfulness to God’s vision has built a mighty family to serve La Croix through all of us. Come…this is the moment God has chosen to fulfill His purpose. To learn more, please go to friendsofhaiti.org , Pittsburgh, Pa. Scroll down the “Homepage” to “La Croix Technical School” all the information you need to share your gift, your piece of the puzzle is right there. Please read the “Funding Guidelines” and Letter from the Director”. Please email us with your questions. Why give to someone who may never be able to give back? Why, because as followers of Jesus, we are all called to the mission field. Be sure of this… as you give of your time, talent, and treasure God will bless you, we know this to be true…”You cannot out give God!” God has given many of us a piece of the puzzle, the theme at this past year’s Haiti summit… it takes every last piece to complete the puzzle, the bigger picture, or in this case…God’s purpose… What will you do with your piece? Will you help complete the picture?